In Autumn, it is over-whelmed by a fiery red to ornage colouration of leaves lasting several weeks. This incredibly beautiful Liquidambar styaciflua tree will truly transform your garden with it year-round colourful displays, but it is in the darker months of autumn when this stunning tree really comes into its own. Commonly known as 'Sweet Gum', It produces attractive, glossy, green maple-like leaves in spring and summer, accompanied by small, yellow-white flowers. The tree's bark is very unusual, with scales that become wonderful deep ridges as the tree ages. It produces a sticky, sweetly-fragrant resin when cut, hence the name! In autumn, the foliage starts to change colour spectacularly, literally engulfing the tree in shades of fiery-orange and brilliant-red! 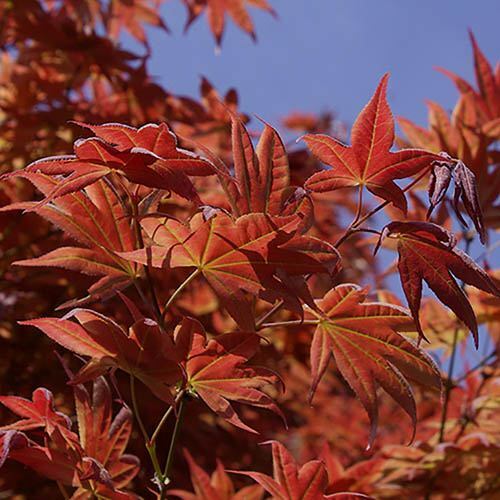 This really is one of the very best trees for autumn colour, and makes a wonderful feature tree, or will shine at the back of a border. Supplied as a 60-80cm (2-3ft) pot grown maiden, ready for planting.